What did they wear in the Wild West? Your child can find out with these fun paper dolls. These dolls are all ready to get dressed in some old, western costumes, but they're missing one thing: color! Your child can help them out by coloring in these pages and cutting out the dolls and their costumes. Then - yee-haw! - get ready to start playing! Help your child color this cowboy critter and the Wild West scene. What better way to learn about other cultures than with world paper dolls. Kids color the doll, then use the country clues to figure out where he's from. 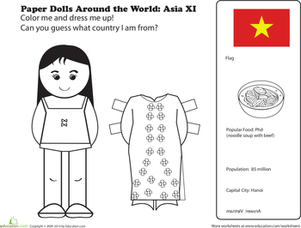 Sneak some learning into paper doll play with an Asia Pacific paper doll. Kids learn facts about Korea as they color, then try to guess the country. 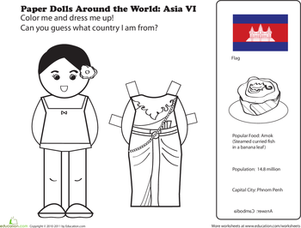 Sneak a geography lesson into paper doll fun with this worksheet that features a paper doll from an Asia Pacific country. Can you guess where she's from? Print out these paper dolls and she can have princesses to dress up any time she wants.